Since Joseph Henry Elgie’s original book Stars Night by Night was published in 1914 we have lost none of the wonder and fascination of the night sky. This book is a celebration of his work, which will encourage and inspire you to develop your own love affair with the stars. The constellations were devised by mankind to create harmony out of the night sky’s seemingly-chaotic array of stars. Even though modern astronomers know a great deal about the stars, the age-old fascination humans have for the mysteries of the skies has not diminished because of this. Written at a level to suit both beginners and more-experienced stargazers, Stars Night by Night offers the opportunity to observe and discover the constellations that adorn the night sky. Starting with the brilliant Orion, which is visible to astronomers the world over, the book takes us on an odyssey around the heavens, during which we follow a celestial trail, hopping from one constellation to another using the previously described star group to take you on to the next. Every constellation is covered and along our journey we discover their origins and mythology together with snippets of interesting information about the main stars and other celestial wonders which form each group - for example, double and variable stars, star clusters, nebulae and galaxies. Stars Night by Night is relevant for any year and any level of knowledge and provides a portable, interesting, thorough and quirky guide to the night sky. It is sprinkled with quotes from Joseph Henry Elgie, which take us back to his observing experiences, as well as thoughts and observations from other astronomers of his era and before. Elgie’s wonderfully poetic language would give anyone incentive to look upwards in the night and see and feel the wonders he so beautifully describes. 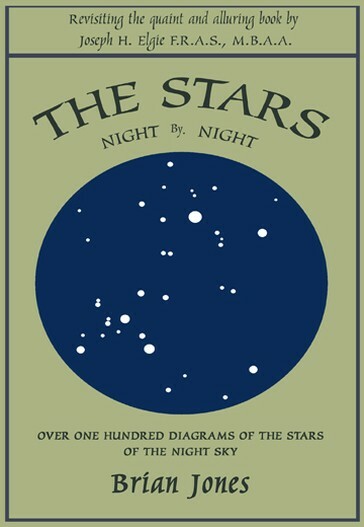 This modern version of Stars Night by Night is a fitting tribute to Joseph Henry Elgie whose own book Stars Night by Night was an inspiring and encouraging guide to those backyard astronomers who turned its pages over a century ago. His interest in astronomy continued into adulthood taking him into the realms of writing sky guides for local newspapers, appearing on local radio and television, teaching astronomy and space in schools and, in the mid 1980s, becoming a full time astronomy and space writer. His passion for astronomy and an appreciation of the universe is reflected in his writing. Brian has written a total of fifteen books, as well as being co-author and contributor to many others. A number were for children including First Facts: Space, A Look into Space and Space Exploration. The books Brian has written for an older readership include The Practical Astronomer and An Introduction to Practical Astronomy – both being guides to practical astronomy for amateur stargazers.